DC Unchained is a brand new action game for Android and iOS devices. The game features amazing challenging missions in which you defeat the hordes of enemies with the help of heroes and villains. DC Unchained game offers a variety of content; PvP mode, campaign mode, lots of characters, amazing gameplay, and much more. In this post, we have covered DC Unchained cheats and some useful tactics for you. Let’s start the DC Unchained cheats to get free gold, list of best heroes, and skills. 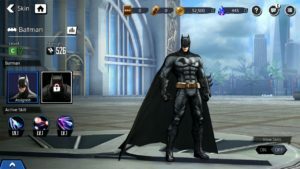 Batman in DC Unchained game has five active skills, five passive skills, and two unique skills. DC Unchained cheats -> If you know about each skill your characters have, you can efficiently use them in the battle and it increases the chance of getting the victory. So you should know about your skills. DC Unchained cheats ->Equipping the best skills of heroes for the battle increases the chances of getting the victory. These passive skills of heroes in DC Unchained game will help you during combat. DC Unchained Cheats -> Unique skills -> Leader skill gets activated when the character is set as a leader. Member skill gets activated when the character is not set as a leader. The Joker is another member of Batman Family in DC Unchained game. His active and passive skills are very powerful if used in a perfect manner. DC Unchained Cheats -> The player can change the order of skills; just drag and drop under the skill menu of a character. DU Unchained cheats -> Upgrading the skills of characters improves overall performance and increases the chances of getting the victory in every match. Catwoman is another main character of Batman Family in DC Unchained game. Her powerful stats contribute a lot in increasing the team power. DC Unchained cheats -> You can equip one gear per active skills. The player can set up character’s situational behaviors pattern by acquiring and equipping tactics. DC Unchained Cheats -> You can equip three active skills and two passive skills. Analyze each character’s skills and equip those which benefits you in the combat. Wonder Woman is one of the main members of Wonder Woman family. Her stats are enough to afraid enemies. Equipping the best active and passive skills improves the overall performance. ⇒ DC Unchained Cheats -> Character’s skin improves the stats. You can buy skin in exchange for the gold family card or skin ticket. You will get new powerful skills; active & passive after you unlock the new skin of a particular hero. Flash is the main character of Flash Family. His speed is very fast in comparison to other heroes featured in the DC Unchained game. DC Unchained Cheats -> Before you start the battle in the game, you can test the skill of a hero by playing in the free trial mode. Go to the team section -> tap on a hero -> skills -> at the left side tap on the free trial option. DC Unchained Cheats -> To get more free rewards in DC Unchained game, join the guild and participate in Guild activities to earn more contribution points. Superman is one of the coolest characters in the DC Unchained game. He can fly, shoot, punch, and easily defeat the enemies. Go to the achievement section -> check out your quest and complete to get free gold, stamina, gold.